Its been well over a year since I first wrote my Woven wrap baby carrier post and even more importantly I am a second time mom and maybe a bit more seasoned at this point. It's also my most viewed blog post so I thought it was time to revisit the DIY woven wrap subject. I have in fact learned a great deal in my babywearing and DIY baby carrier "career". So first off lets just come out and call a spade a spade. Name brand woven wraps are expensive! Even used these simple strips of fabric can cost you $300... or google "pamir" and let the jaw dropping begin... these limited editions are procured by auction and sell for over $1,000. Let me be clear here, this is a sheet of fabric that your little baby is going to puke, snot, and possibly poop on! This is a sheet of fabric that is going to drag on the ground while you wrap your squirming toddler in the walmart parking lot. If you are adventurous like me, this is a piece of fabric which will go hiking with you and get snagged on trees and dropped in mud. It will be dragged from your living room to your kitchen by your sick toddler who needs snuggle time while you need to cook spaghetti. I don't judge anyone for spending however much they chose on a wrap or carrier of any kind at all. But for me, I don't think I could live with myself if I knew I ruined a $1,000 piece of fabric. Not all wovens are really that expensive though. Sometimes you can find a good price on a used wrap. Don't be put off by the "used" condition... a used wrap is usually outrageously blankety soft and broken in. There are some brands or even different weaves and blends of the same brand that will fetch a different price. What makes a name brand woven wrap any different from your DIY wrap? Well that list could go on forever but suffice it to say that a name brand wrap is made specifically for babywearing. These are companies/designers/people who have studied the art of weaving and have used their knowledge to create something specifically meant to carry babies. Different weaves accomplish different things. For example, a diamond weave will be a bit more supportive than a simple twill weave. And then there are the countless fiber combination options. Cotton is soft and blankety but can lack some support for heavier babies or very extended periods. Silk is strong and soft but delicate and requires special washing. Wool is also strong and soft and warm but again, special washing. Hemp is outrageously strong and supportive for heavy babies and extended wear. Linen is also outrageously strong and often referred to as "beastly" in the babywearing world. Bamboo is usually described as "marshmallows" and for good reason! It is so very very soft but it can be less supportive. Also as a viscous material bamboo can be susceptible to damage when saturated, so extra care should be taken when removing from the washer! Even within the different fibers themselves content differs and offers even more countless options and differences! You can easily lose yourself completely in the world of woven baby carriers! I now own three name brand wraps. A very well used (got it in a trade) dolcino bali 100% cotton which has been chopped to a size three (we will talk sizes and acronyms later). Also used, Linuschka Kalejdoskop Lila 100% linen in size 6. And also used again, a Natibaby Pearl Pancy 20% linen 80% bamboo in a size 6. I have made countless DIY woven wraps and while you can make a great DIY wrap you can't really compare a DIY to a wrap woven specifically for babywearing. My go to fabric for a DIY wrap is linen. It is strong and supportive and a good safe material. You really can't go wrong with a linen if you are DIYing a wrap. We live where the summers can be outrageously hot though and so in the summer I love a gauze wrap! But gauze can be "diggy" on your shoulders and baby's legs if you do a sloppy wrap job or wear for a long period. If you want to mimic the name brand woven material you will be best suited to check out the upholstery fabric section. Be careful there though... avoid all polyester and poly blends. They are just too "slippery". A 100% cotton is nice as is linen but linen upholstery is very rare. Look for a simple or diamond twill weave or some jacquard weaves. Also avoid all quilters cotton. It's not supportive or safe. Since most wrap weavers are in Europe they are sized in meters which can be a little confusing when you want to DIY a wrap. Here's the conversion to help you along. Most brands widths are also measured in the metric system and vary between 64cm (25.2in) and 77cm (30.3in). Some of the thicker wraps are not as wide because they'd be too overwhelming. A thinner wrap can be quite wide or not. I prefer a wide wrap especially when wrapping my toddler! Most material on the bolt is 45-60in wide. So you can potentially get 2 wraps from one piece. When I get 60in wide material I split right down the middle and have two wraps 30in wide each. If the material I want is only 45in wide I still cut to the 30in wide and I use the remaning 15in width to make a wrap for my daughter or I find something else to do with it. You could even get really exciting and buy 5 yards to make yourself a size 6 wrap and with the other half of your material you can make two ring slings! Three baby carriers for way less than the price of one! 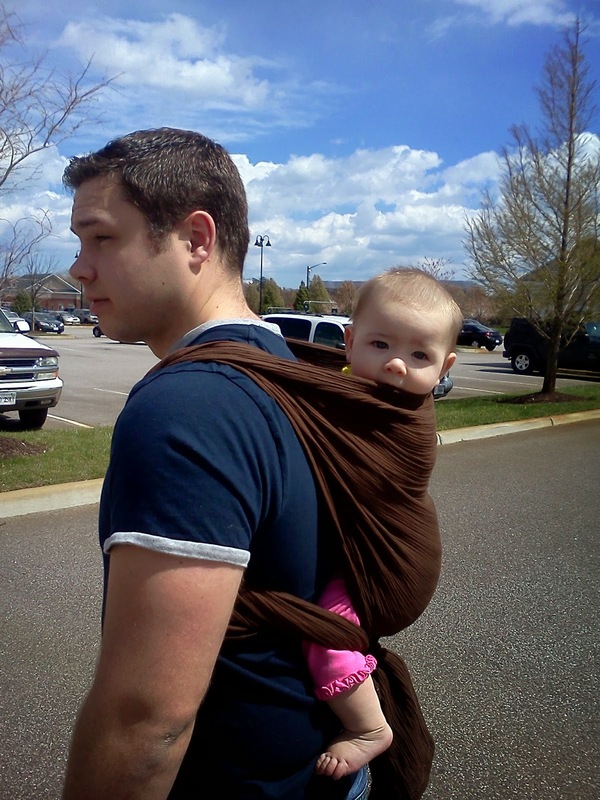 A wrap is the most versatile baby carrier you can get because the possibilities are nearly endless. There is a bit of a learning curve though and some people just get frustrated and find something less time consuming. The best thing about a woven wrap is the safety and structure is in how you wrap it! It's a simple piece of cloth and it is safe to use because you are going to tie it on there properly. Even a beginner seamstress can make a perfectly safe and wonderful wrap. A beginner may not want to make a ring sling or a mei tai but a wrap is just a rectangle with hemmed edges and anyone can do that! Here are a few pictures of some of my favorite carries in some of my wraps! When I find the time I will add some videos of my favorite carries. But right now my babywearing model is asleep in my lap! 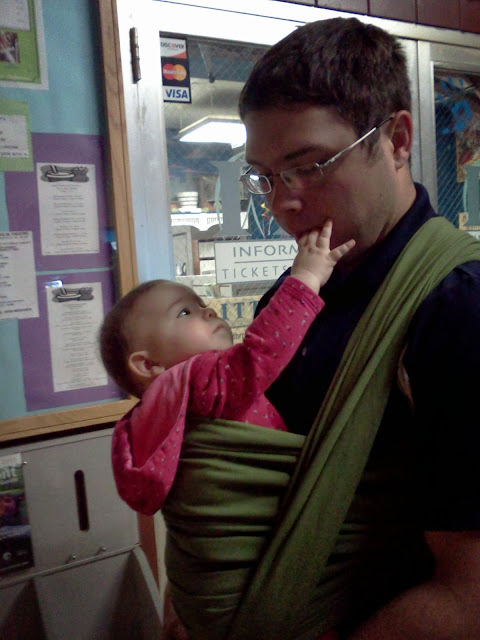 I don't know where I would be without babywearing. We have recently moved so my 9 month old has been a little clingier than usual. Lately the only way she naps is on my back. Double hammock was my first ever back carry and has always been a favorite for us. What if you cannot see or own a sewing machine. Is there hope for me??? How else would I get the end to not unravel?? I am legally blind, so hate sewing machines. I do all my sewing by hand with special self-threading needles (sold at stores like Jo-Annes or online, so easily available). I wonder if the iron-on sticky hemming tape would work too. A diamond weave is typically not found at the fabric store but a twill is the most common of all woven material. Likely anything in the linen will be twill or jaquard. You could just ask them to direct you to the woven linen section and anything from there should do. All you want to be sure is that it's a woven, not knit or jersey, material. What about linen weight? Does that make a difference? I've got and seen everything from sheer linen to near canvas weight linen. What weight would you recommend? Thank you for the information! I was wondering if gauze will work for a ring sling? I live in TX & summer is going to get HOT! I have a 1yr old about 20 pounds. Also, can you back carry with gauze? This is really great information! I just finished a gauze wrap but I wanted to make another one with a different fabric. I'm pretty new to sewing and fabrics so I'm not 100% on what I want but I was thinking of using a muslin (buying it plain so I can dye it!). Is that a good wrap fabric or should I look for something else? Sorry, so late to getting to you. Muslin is ok but not exactly ideal... especially for an older bigger baby. Ok. I love your information! Unfortunately, my idea of DIY was just buying 5 yards of fabric, washing it & then wrapping my little one, i.e. no sewing involved. Do I have to hem the wrap? Sandra, some materials can be left unhemmed but please expect a little fraying. You could also do an iron on hem if you cannot sew. Where did you find your used wraps? I really would love to find a used woven wrap. I am going to carry a 25lb toddlers on hikes and my moby is just not tough enough to support him. There is a big swap on facebook called "The Babywearing Swap" that offers used wraps but be advised, not all used wraps are cheap! They maintain value and some which are really hard to get even go up in value! If you are not on facebook consider joining "The babywearer" forum. They also have a swap. It is a forum based site and each of those swaps has very strict rules so be sure to read up on those before posting! Would they sell appropriate linen gauze or jacquard weaves at Spotlight or Lincraft? If not, where does one buy such material in Sydney? Hi! Would 100% cotton batik fabric be appropriate for a woven wrap? I'm stumped by the selection at my local fabric store. I really don't want it to look like I'm carrying my baby in a curtain! Thanks! It sounds like you are talking about a quilters cotton which should not be used for carrying babies. Linen, gauze... those are your best bets. If you don't want it to look like a curtain then look for a plain fabric that you can dye yourself! Cheap and custom! Hi! I have seen a lot of suggestions for using Osnaburg 100% cotton for DIY woven wraps. Have you used that? My sister is wanting to make me a baby wrap but I am uncertain where to buy the fabric. Are there any websites you could recommend? I live in a pretty rural place that is not near big fabric stores. And when buying linen, is it ok if it is a linen/cotton blend? Any more advice on exactly what type of fabric to use and where to get it would be great. Thanks! This is AMAZING! It makes woven wraps a lot less "scary." Which is how they kind of seem. Although anything that enables you to carry your SISTER can't be too bad! How do you work out the lengths of the tapered ends for wraps? are they included in the lengths you give above? Usually you measure taper to taper... as in long to short. So to work in tapers I would add about 2 or 3 inches to whatever size you want to make your wrap and then cut your tapers. If you look at my previous post on wraps you will see how tapers usually are cut. So in my excitement I bought the wrong kind of material for a woven wrap (I guess my fabric store people aren't too helpful sometimes). I bought 100% cotton craft fabric. Is there anything I can do with it for baby wearing? Can I line it with something? Great info but I need to correct some info about gauze. Safety first. Gauze needs to be used with 3 pass carries to be safe (so a ruck isn't a good idea.) And it should not be used as a ring sling fabric unless yoir doing a no sew and just passing your wrap through rings. If you have a lot of spare time, it might work to make the wrap a few inches wider, deliberately pull a fringe and knot it like a rug or scarf, but you and baby may find the knots uncomfortable and I don't know how it would affect the strength of your fabric. I'm looking to make my Organic Cotton Undyed Woven Wrap. I found this great website with so many options. Do you you have suggestions which one to pick? http://organiccottonplus.com/collections/wovens-undyedFabric and found this website. Hi!i bought a thick woven silk is that ok? Hiwould a linen rayon split fabric work? I REALLY love this post! Makes babywearing an achievable goal, cost wise. Thank you! One question is how to determine base-size with a wrap. I have heard the term and some numbers tossed around... I am just not sure what length would be best for my body type. Jersey is good for a stretchy wrap which wouldn't be comfortable for long periods with a 17lb baby. I don't think you can back carry with those either.